Morgan Bushe’s new Irish feature ‘The Belly of the Whale’ starring Pat Shortt (‘Garage’, ‘Calvary’) will be released in Irish cinemas on Friday, December 7th. The debut feature film from director Morgan Bushe also stars Lewis MacDougall (‘A Monster Calls’, ‘Pan’), Art Parkinson (‘Kubo and The Two Strings’, ‘San Andreas’), Michael Smiley (‘Kill List’, ‘Jawbone’), Peter Coonan (‘Love/Hate’, ‘The Drummer and the Keeper’) and Lauren Kinsella (‘You’re Ugly Too’, ‘Albert Nobbs’). Set over a long bank holiday weekend, misfit teenager, Joey Moody, returns to his home town in a bid to reopen his family’s crumbling caravan park and salvage his friendship with his best friend, Lanks. Meanwhile, on a mission to find the money to cover his wife’s medical expenses, Ronald Tanner, a fractured soul, risks his meagre life savings on a get rich quick scheme that ends in abject failure and humiliation at the hands of local big shot Gits Hegarty, pushing Ronald over the edge and off the wagon. After Joey accidentally burns down Ronald’s camper van and is forced to find the cash to repay him, the strange pair find themselves bonded together in misfortune. In an effort to change their shabby circumstances they concoct a plan to rob the Pleasurama, the local amusement arcade, and the domain of the iniquitous Gits. “I’m thrilled to be bringing The Belly of the Whale to Irish cinema audiences, a wild tale of a far-out friendship formed between a lawless runaway and a gruff down-at-heel fifty-something. The producer Rory Dungan and I were fortunate enough to assemble such a dedicated and passionate team to get the film made, on both sides of the camera, and are excited that our collective creative endeavours will now get to be seen in cinemas across the country." 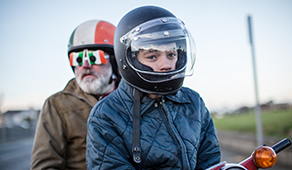 The film, which opened the Galway Film Fleadh during the summer had its North American premiere at the Chicago International Film Festival as part of the New Directors Competition earlier this month and also screened in the Panorama section of the Rome International Film Festival. Bushe has previously directed the award-winning short films ‘Doghouse’, ‘Mr. Crocodile in the Cupboard’ and ‘If I Should Fall Behind’, which was IFTA nominated and received the Torc Award for Excellence at the Celtic Media Festival, and produced acclaimed Irish films ‘The Other Side of Sleep’ and ‘Anton Corbijn Inside Out’. ‘The Belly Of The Whale’ was produced by Rory Dungan for Fastnet Films and Tilted Pictures with funding from Screen Ireland, RTE, BAI, Slovenian Film Centre and Windmill Lane VFX.